For the pet that gives you unconditional love. One of the most important things you can do for your pet’s quality of life and longevity is to bring them in for routine physical examinations. During these wellness visits, we will carefully check your pet’s different body systems for signs of irregularities. Illness is often easier to treat when caught in its early stages, making this a cost-effective strategy for you and your pet. 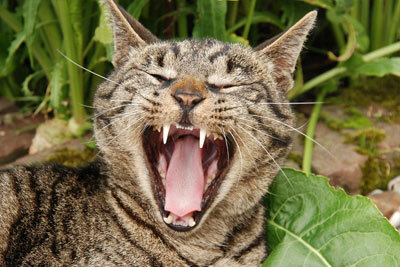 First, the all-important question: Does my pet need a dental cleaning? If your pet is 3 years old (or younger for some smaller breeds), they should begin having dental cleanings and assessments at least once a year. If the veterinarian has identified that dental disease has begun to affect your pet, it is important to have the dental done as soon as possible to prevent possible pain, discomfort and illness for your pet. If your pet meets the criteria above, please call us or request an appointment. If the condition of your pet’s oral health has not been assessed by one of our veterinarians, we recommend scheduling a free dental assessment prior to the procedure, so that we may provide you with an estimate. Your pet should not have any food after 10 pm the night before the procedure. Please complete the anesthetic procedure authorization form to bring with you the morning of the procedure. This will save you time during your pet’s drop-off. We will call and/or email you to remind you of this. Please confirm your appointment or call to reschedule as soon as you are aware that your schedule has changed. We ask that you drop your pet off between 7-7:30 am. Please bring the anesthetic procedure authorization form or fill it out in our office the morning of the procedure. 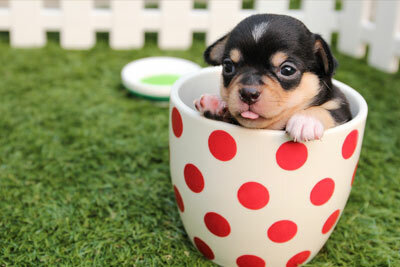 Your pet will be taken to a comfortable kennel that has been thoughtfully prepared for him or her. 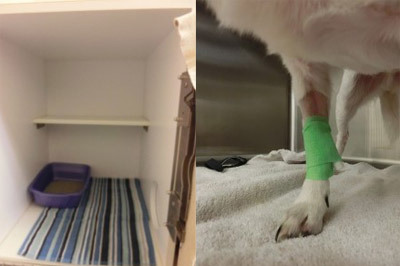 Cats are kept in a separate ward that provides a calm and relaxing space away from the hustle and bustle of the hospital.Dogs are given roomy kennels with cozy blankets and fresh water. We will place an IV catheter that will allow us to administer fluids throughout the procedure. This single port gives us the ability to administer other medications as needed for your pet’s comfort. When it is your pet’s turn, we will pre-medicate him/her so that they will become very relaxed before inducing anesthesia. When your pet is comfortable and relaxed, we induce anesthesia. This allows your pet to sleep comfortably and painlessly through the entire procedure. 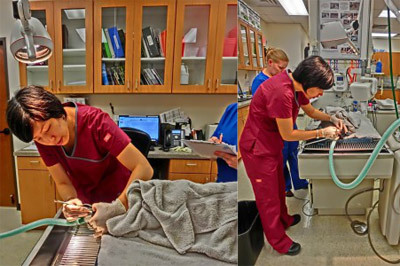 Throughout the anesthetic process, a skilled technician monitors your pet’s vital signs through advanced monitoring equipment. Fluids are administered throughout the procedure to help your pet’s internal organs process the drugs and pass them out of your pet’s system after the procedure. The veterinarian is present throughout the procedure to monitor your pet, assess the condition of your pet’s oral health, and perform procedures. Each of your pet’s teeth will be cleaned and polished with industry-leading equipment, very similar to what you would find at your own modern dentist’s office. Dental Radiographs may be performed to assess the condition of the teeth below the gum line. We have intentionally priced our full-mouth dental x-rays to be an affordable part of your pet’s wellness care. If extractions are necessary, the veterinarian will perform this procedure and suture the empty sockets with absorbing sutures when necessary. A dental chart will be completed during the procedure to show you the exact location of any extractions or problem areas that have been identified. When your pet’s teeth have been cleaned, polished, and any other issues addressed, we will then recover your pet from anesthesia by reversing the drugs. 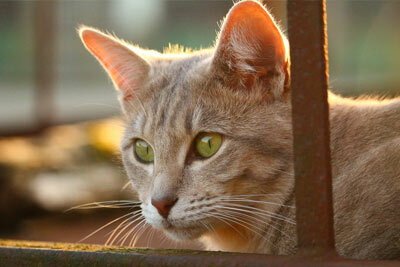 We continue to monitor your pet’s vitals throughout this entire process. When your pet is fully awake, he/she will rest comfortably in our treatment area so that the team can continue to monitor their recovery. We will give you a call when your pet has awakened from anesthesia to update you on the procedure and schedule a pick-up time. Once your pet is fully recovered from the anesthesia and we have monitored him/her for a few hours, they are ready to return to your care. When you arrive to pick your pet up, we will discuss with you the necessary at-home care and any important medications. 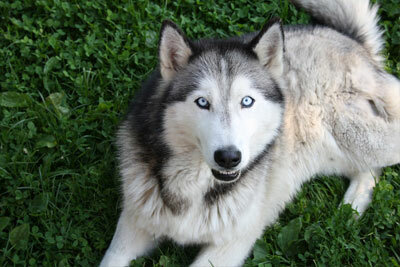 Your pet will then be returned to you with pleasantly fresh breath and beautiful pearly white teeth! A healthy heart can allow your pet to play for hours in the great Austin outdoors but an unhealthy heart can slow your pet down and may shorten their life expectancy. We evaluate the health of your pet’s cardiovascular system via annual heartworm testing, auscultation (listening to your pet’s heart rate and rhythm via stethoscope), EKG, and a revolutionary blood test that offers early detection of heart disease.If more advanced testing is required, such as an echocardiogram, we can arrange for a mobile ultrasound to be done at our hospital. 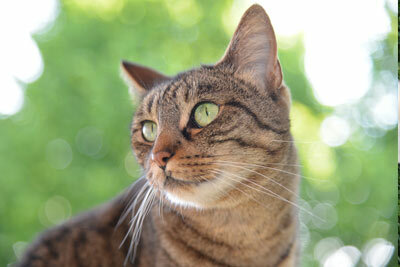 We also have the option to refer you to a local veterinary cardiologist. We offer several options for heartworm prevention at our hospital and have a full line of products in our new online pharmacy! 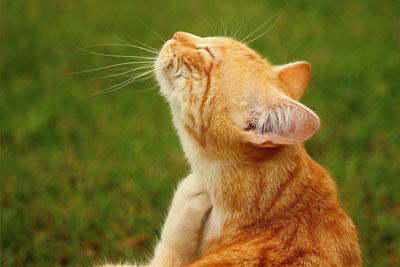 From allergies to parasites, living in Austin can contribute to diseases that affect your pet’s skin. If your pet is biting or scratching excessively, shedding more than usual or losing hair, has red, raw, bumpy, or scabby skin, he or she likely has a treatable condition they do not need to suffer from! We can guide you through the diagnostic process and can offer a choice of treatments to make your pet comfortable again. We all want our pets to live long happy lives so we can spend as much quality time with them as possible. We run and play with them when they are in their playful moods, and feel their pain when they aren’t well. Pets have the same internal organs as humans and can have just as many problems with them as we do. In general, the older the pet, the more likely they can develop problems with their digestive, urinary, and vascular systems. Some may be mild and normal with older age, but others may cause nausea, pain, or even death. As our pets age, we recommend annual or sometimes even semi-annual bloodwork to try to find these diseases early, when they are most easily treated. Our pets age much more rapidly than do humans, which means a large dog may be considered senior at age 5, while cats and small dogs generally are considered senior at age 8. Please see our page on Wellness care to determine the proper preventative care for your pet based on his or her age and species. Cancer is devastating no matter what species is battling it. We have multiple tools that help us find a diagnosis for you and your pet rapidly and efficiently. We can offer many treatment options, no matter what your goal for your pet is; from simply relieving the symptoms of the disease to trying to get a definitive cure. If more advanced treatment such as chemotherapy or radiation are warranted, we can refer you to the veterinary oncologist to help your pet fight this battle. We all know how much our pets love to watch birds fly around in the backyard, watch the ball so they can chase it down to bring back to you, or look at other pets as they pass by. 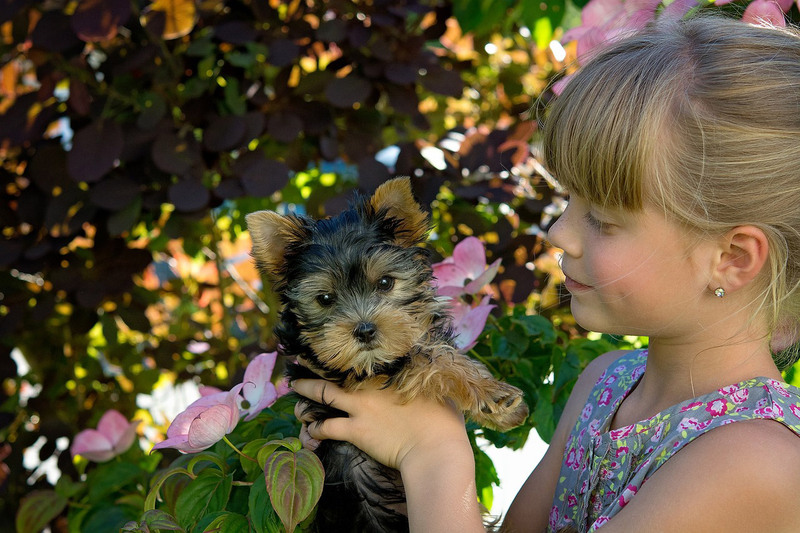 Normal healthy vision affords our pets these small pleasures in life, and helps them maintain their overall health by helping them avoid danger. Eye problems are a common source of pain, and if left untreated, can lead to permanent blindness. Many things can affect the eyes that may be easily treated and relatively mild such as allergies, but others may spiral into much bigger problems that require intensive care. A quick trip to your vet can help you easily and quickly distinguish these issues and determine a proper course of treatment if needed. Some common symptoms that indicate an ocular problem are an increase in tear drainage from the eyes, a hazy or milky colored cornea (the clear surface of the eye), thick discharge, and red, irritated eyes. At South Park Animal Hospital we use the safest anesthetic protocols available. This means choosing the drugs that are safest for your pet, administering intravenous fluids throughout the procedure to help filter and protect internal organs, and vital sign monitoring through advanced monitoring equipment. The result is a standard of care much like what people receive at human hospitals. 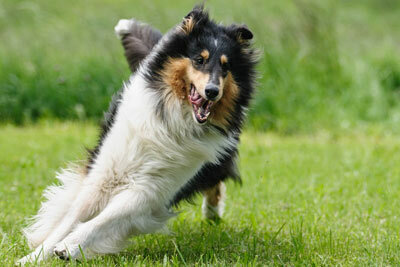 Call us at 512-386-1065 to inquire about surgery for your pet.